Square. Simple. Dignified. That’s the Ellsworth roof cupola from Ridge Craft Select Series. At Millworkcity, we know how important it is to get your cupolas right the first time; that’s why we welcome all of our customers to call us with questions about these windowed cupolas. Our selection of Ellsworth style roof cupolas includes several sizes, so whether you’re handling a small project or tackling a huge one, you’ll find exactly what you need here. 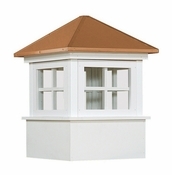 These affordable windowed cupolas feature four open-air windows on each side for extra style. Ellsworth roof cupolas can accommodate roof pitches up to 10/12, and extension bases are available for higher pitches. Additionally, they’re all weathervane-ready. 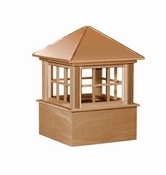 Made from primed pine with wood or copper roofs, or from PVC with aluminum or copper roofs, these cupolas are designed to last.